Complimentary mountain bike rentals and hot, gourmet breakfasts are just a couple of the special extras you will experience at Diamond Point Inn. A new, modern hotel in Aberdeen, WA, serviced by Seattle or Portland International Airports, features hot, complimentary breakfast, free Wi-Fi and pool. The amenities of a large, chain hotel with the conveniences and customer service of a small inn. Athletic club, spa, 5-star dining and banquet room. 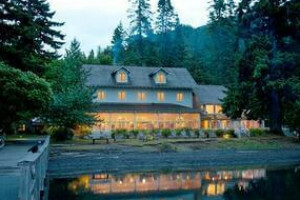 Rustic elegance characterizes this Port Angeles hotel, with 105 comfortable oversized guest rooms. Amenities include breakfast, heated pool, spa services, wifi, and more. A great, central location, free high speed Wi-Fi and affordable rates make this hotel a winning bet. Occupying the top 2 floors of an 1889 building, which was featured in historical home tours, this hotel has spacious rooms and lots of character.